Mobay Kotch i Montego Bay, Jamaica : Boka nu! Mobay Kotch is one of the only hostels located in the heart of Montego Bay, Jamaica. It's owned and run by locals who live on property and wants travelers to experience and see the Jamaica that they know and love. 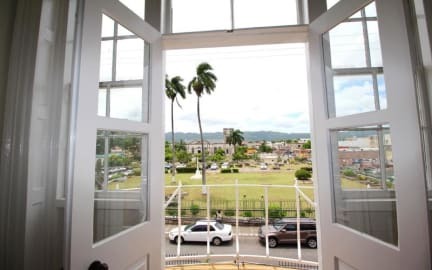 One of Mobay Kotch's charm is that it's located at the landmark, recognized in travel guide books, as 'the Townhouse'. Established in 1760's, this townhouse has a very rich in history and has withstood the test of time. It stands out because of its Georgian style architecture. 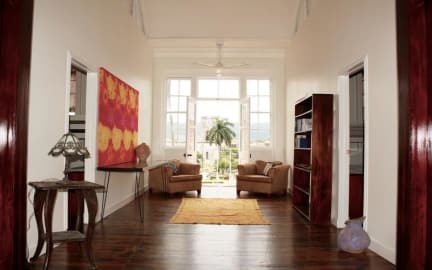 With its distinct red brick exterior, high ceilings, wooden floors and grand windows, the property gives a feeling of being very open and airy while maintaining a sense of privacy and security. - Relax on the white sand beaches and explore the city and surrounding areas. Mobay Kotch offers dormitory room and private rooms to ensure all of your needs are met! Kitchen and Laundry Facilities - Kitchen facilities are available for use. The opening hours are 6:30 AM to 10 PM. A washing machine is available for use for a small charge. Smoking - No smoking in the main building at any time. Designated smoking areas are located outside. Check in from 12:00 to 18:00. Reception opening times; 8am to 6pm. Mycket trevligt och mysigt ställe i downtown i Montigo Bay. Nära till allt för en förhållandevis billig peng. Very nice hostel in Montego Bay. Really big and very clean hostel. Staff is great, everyone is super friendly and try to help you al the time. Kitchen it's alright, works for cooking. Location is right in the city, little bit walk to the beach. The area around the hostel can be little bit sketchy sometimes.